Writer and editor Sari Tuschman may originally be from Ohio, but she is with out question, the quintessential California girl — the perfect mix of laid back, adventure-ready style meets timeless Hollywood glamour. 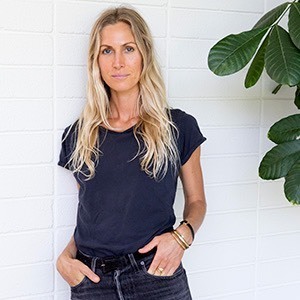 When she’s not surfing, snowboarding or spending weekends at the beach near her home, she’s busy interviewing the biggest designers, celebrities and influencers for her stories across notable publications. Her subjects range from high-end luxury to outdoor sports and adventures and it’s partly this mix and range of her talent that informs her personal style and penchant for accessories that make a strong statement. It’s bold necklaces in particular that the writer wears as her signature piece of jewelry. From a vintage turquoise neckpiece that reflects her love of Aspen, Colorado, where she spends a lot of time, to a heavy metal bib-style necklace that she effortlessly layers with a white button down blouse, Tuschman uses the piece to add her own edgy, elegant or earthy punctuation to a look. Here, she dishes on her start in fashion and media, who taught her to love jewelry and a few of her favorite pieces she’s excited to wear this fall. What drew you to fashion and to making it your career? My grandmother was a super chic woman who was always dressed to the nines, literally until the day she passed away. And my parents are very chic people — they’re of another era, very Tom Wolfe-esque. They, too, are always dressed nicely, and they taught me an appreciation for clothes, nice things and how you present yourself. Sadly, I’m very casual and not nearly as put together as they are, but nonetheless that’s where my appreciation for clothes as an expression of self came from. What would you consider your “big break” and what do you consider your career defining moment thus far? I don’t know if there was one “big break” but I think being the Editor-in-Chief of Los Angeles Confidential was an incredible learning experience as it taught me how to manage a team and look at all the individual pages of a magazine as one larger whole, knowing that one contributes to a larger message. Basically, looking at something from above and knowing that every decision affects the outcome — that’s a lesson I have taken to every job since. No matter what you’re doing, you don’t operate in a vacuum; you have to be aware of everything around you to be truly effective. As far as a career-defining moment, being the Editor-in-Chief of FOAM was probably the job where I got to flex my creative muscle the most, which ended up being invaluable. I think — or hope — that job sort of showcased what I was capable of as a fashion magazine writer and editor. Classic and casual — I, unlike my parents, am all about being comfortable. But I like to choose nice, timeless pieces that won’t go in or out within a season. I mostly stick to denim, black and navy to be honest. And of course, I inject a trendy piece here or there, but I usually try to make it something that makes an outfit and that I know I will wear more than twice. And finally, I’m all about a great bag and beautiful jewelry — I’m a bit of an accessories addict. What trends are you especially excited about for Fall? I am one of those weird people who actually enjoy cold weather so I’m always excited for the new season’s array of fabulous coats. Capes will be hotter than ever, and I think they make for such an easy, elegant look. Also, puffers are coming in all shapes and styles this fall, which I’m excited about. I love when a functional piece goes chic. And finally, I’m all about a good sweater so I’ll look forward to indulging in a new slew of cozy pieces for hanging out by the fire! Have you always had an affinity for jewelry? What is your aesthetic when it comes to jewelry? Yes, I have always loved jewelry, and I think that derives from my grandmother and mom as well. Even as a little girl, I remember going through my mom’s jewelry box and picking out things I wanted to wear (something I continue to do to this day). My mother has never left the house without jewelry on and neither did my grandma, and if I ever do for some reason, I feel naked. You love a great statement necklace? When did that passion start? I like pieces — both in jewelry and in clothes — that make an outfit. I don’t like an outfit to be overly complicated so I choose simple pieces that fit well and then add some excitement through a great necklace and maybe a couple other pieces. You can completely change the mood of the outfit simply by switching out the jewelry. Switching out a blingy statement necklace for a bohemian squash blossom totally alters the tone of a look — I love jewelry’s ability to do that. Why do you feel necklaces are a great accessory and what is your favorite way to style one? Well, given that I tend to be a very casual dresser, necklaces are an easy way to dress up an outfit in an instant. My favorite way to style them is to take a super relaxed look, like a tee and jeans, or even a sweatshirt, and add a fun, blingy necklace or layers of gold necklaces for that unexpected mix of laid-back and fancy. I feel like that is a very cool, LA look that fits my personality and lifestyle. What are a few of your favorite pieces or the one piece you especially covet and why? I searched for a vintage turquoise squash blossom for YEARS and finally found an amazing one in a store in Joshua Tree a couple of years ago — it was the best find EVER. And every day, I wear my mom’s college pin that she turned into a bracelet, which is my favorite piece I own. I also wear one of my grandmother’s rings on a daily basis. They are so beautifully crafted and carry so much meaning for me. I love having a piece of her with me. And beyond that, I wear a tiny pave diamond heart necklace by Ariel Gordon every day and usually a piece from Dylanlex, Jacquie Aiche or Kathy Rose because I worship everything those designers do. Who are your favorite jewelry designers? Dylanlex, Kathy Rose for Roseark, Jacquie Aiche, Hermes cuffs, Chanel costume jewelry, Ariel Gordon — and I just discovered Loren Stewart, and I’m really liking her stuff! What is your approach to buying or selecting jewelry? Do you love a certain stone, era or feeling? It’s really about what I see myself wearing day after day. I don’t want to buy something I think I might grow out of. I still wear my grandma’s jewelry and love it. Some of my favorite pieces are vintage or were my mom’s. Jewelry that stands the test of time is the most beautiful thing you can own, and then it ends up telling a story and carrying so much meaning. I don’t go for a certain stone or look necessarily, I just try to choose pieces that I love and that I think I’ll still be wearing and loving years from now. See Sari’s favorite pieces from Beladora below. The Look for Less – Colorful Coral Bead Necklaces!